Our Special Offers feature hundreds of overstocks, clearance lines, discontinued items and so on, all at unbelievably low prices. You'll need to hurry though because these prices are only while promotion stocks last!! 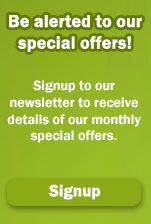 The Special Offers section is updated monthly with new items, so be sure to check here regularly! If you would like to download the complete list of Special Offers in PDF format then please click here. Be alerted to our special offers!